A total of 299 players participated in the Copenhagen leg of the European Poker Tour and after six days of pulsating play, one of the youngest players - and possibly the eldest player - found themselves seated across the table playing heads up for a first prize of 2,515,00 DKK (€338,133). You could not have written a more intriguing script, as the cherubic PokerStars Team Online player, Mickey "mement_mori" Petersen was pitched into war against the more mature Team PokerStars Pro Pierre "Zoutechamp" Neuville. Unfortunately, the script went out of the window as the heads up match was devoid of any of the razzmatazz than came before it. In truth, it was an unexciting anti-climax lasting six-hours, which was dominated by the younger poker player. Neuville looked tired, weary and looked like he had simply ran out of ideas while the time just seemed to go on…and on…and on. The action was stuck in a loop with Petersen raising Neuville out of the game until the Belgian would eventually find a premium hand, move all-in and find the double up. Neuville was so patient he would regularly go below the 10BB mark in order to wait for his premium hand to arrive! Then finally, after six hours of non descript activity Mickey Petersen finally managed to get Pierre Neuville to call an all-in showdown where Petersen was ahead. It was the of Petersen versus the of Neuville and everyone was expecting a split pot. The flop of increased the split pot possibilities ten-fold, but the on the turn gave Peterson a chink of light before then the secured the deal and Mickey Petersen was our EPT Copenhagen champion. But it wasn’t always this uninspiring…. We didn't even breach the second level of the day before we lost our first player. The former Sunday Million winner, Spencer Hudson, finding in a great spot against the chip leader Aage Ravn and his . The flop was clear of any mines - - before the on the turn blew Hudson's dream of a double up apart and sent him reeling to the rail. The first level ended with Hudson being the only confirmed casualty, and Ravn extending his lead at the top. We waltzed into Level 24, with blinds at 12000/24000, and Steve O'Dwyer became the second person to leave the EPT Copenhagen final table. Once again Age Ravn played the role of the conqueror but this time he did not have to come from behind. The Norwegian's dominating the of Ireland's latest resident, and the final table wrecking machine was out in 7th place. While Americans were being deported left, right and centre there was a Dutchman who had developed a seemingly perfect strategy. 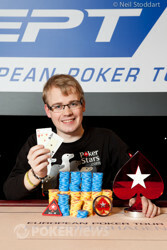 Niels van Alphen found pocket aces and then pocket kings, and each time a willing partner to play all-in poker. But just when van Alphen was seemingly finding premium hands for fun, a Belgian found one with just a little bit more strength. Van Alphen found and Pierre Neuville found and the Dutchman was out in 6th spot. Next out was Jacob Rasmussen after Petersen called his all-in holding . Rasmussen had and a slight mathematical advantage, an advantage that would flip on it's head after an flop! Rasmussen found himself in a minefield with nowhere to turn and the sealed his fate and a 5th place finish. 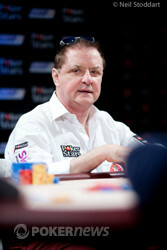 Pierre Neuville was managing to survive, including a double up versus Petersen, but he was still odds on to be eliminated in 4th place. Then Ravn's continuing descent into oblivion was complete after he got his chips into the middle holding while Hansen found . Ravn looked likely to double up as the hit the board but the on the river dashed his hopes and we were down to a triumvirate. Level 27 was a great one for Neuville as he glided to the top of the chip counts after a series of huge pots involving another clash with Petersen. With all three players on an even par Bjarke Hansen raised to 100,000 on the button, Petersen three-bet to 255,000, Hansen four-bet to 550,000, Petersen moved all-in and Hansen called. Neuville was licking his lips as Hansen tabled and Petersen tabled . The board changed nothing, Hansen was out and the intriguing heads up encounter between Petersen and Neuville was set. Congratulations to Mickey Petersen for winning the EPT Copenhagen trophy, a nice shiny Shamballa bracelet and 2,515,000 DKK in prize money. The juggernaut that is the EPT now moves on to Madrid on March 12-17, so make sure you join us for the very best poker action. Mickey Petersen open-shoved and Pierre Neuville made the call! A chop looked the most likely result especially when the flop came down . 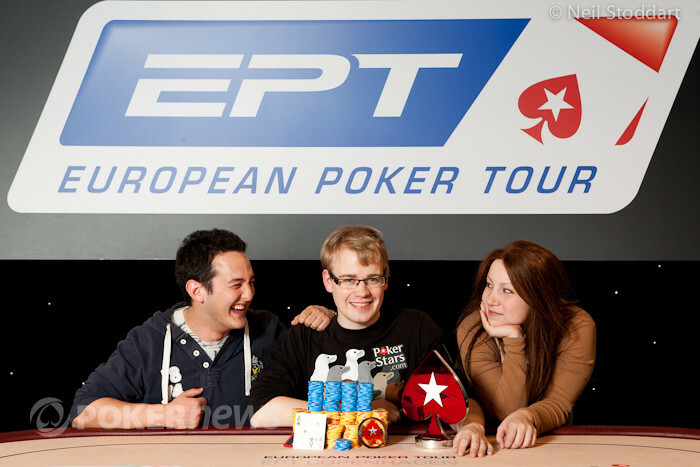 The kept Petersen in front and the river was the and with that Mickey Petersen becomes the EPT Copenhagen Main Event Champion and Neuville finishes in second place for the second time in an EPT Main Event. For a second time Pierre Neuville let himself get blinded down to a ten big blind stack before he made a stand, and yet again, he found a monster to defend with. Mickey Petersen shoved from the button and Neuville called all-in. The board ran and Neuville has chips to play with again. Put the kettle on people, we could be here a while longer still. Pierre Neuville is deploying a most unusual strategy where he is folding down to 5 or 6BB seemingly unwilling to move all-in without a premium hand. He eventually looked down and saw cards he liked and moved all-in. Mickey Petersen made the call and we had another showdown, where even if Neuville won, he would still be in serious trouble. Neuville now has 1,300,000 which is the equivalent to 13BB and we have been playing heads up for over five and a half hours. We thought it was all over folks but Team PokerStars Pro Pierre Neuville has doubled up. As he had done for the last three or four times he held the button, Mickey Petersen open-shoved and Neuville made the call. The flop hit Neuville but Petersen still had 35% equity with his open-ended straight draw and backdoor flush draw. The on the turn was as brick-like as you can get and when the landed on the river Neuville doubled up. It looked as if Pierre Neuville was building some much needed momentum and then Mickey Petersen put a firm to stop to that. Neuville raised and c-bet a flop to win a pot, and also raised and took the blinds. He then called a raise but check-folded to a c-bet on a flop. The two hands after that, when Neuville was on the button, his raises were met with shoves and he was forced to fold. The play seems to have slowed down again with all pots since our last update being settled preflop. We all got a little excited when we saw Mickey Petersen open to 200,000 and Pierre Neuville three-bet to 500,000 but when Petersen shoved Neuville snap-folded. It's been all Mickey Petersen since we've returned from break and Pierre Neuville is getting dangerously low. He's hardly got to showdown as Petersen is forcing him off most hands. The most recent example saw the Belgian call a raise to see a flop. Both players checked to the turn and that invited Neuville to lead for 200,000. Petersen had a plan though and raised to 500,000. Neuville quickly folded.